I have always used broccoli and carrots in stir-fries and pasta. But recently, I discovered that they also taste great with rice. Once I discovered that little secret, I started some experiments involving these two core ingredients. I’d already decided that I’m not going to spent hours in the kitchen, so I wanted to keep the recipe as simple as possible. After a few tweaks, I came up with this easiest and delicious combination of broccoli, carrots, and rice. This broccoli carrot rice ticks all the boxes for the right kind of healthy meal. Furthermore, it’s delicious as it is, but you could add in any kind of protein you like. You could even enjoy this rice with your favorite curry. Seriously, what’s not to like about this winner meal. I mean, it’s the tastiest way to sneak some veggies into your diet. This was a delicious side dish. I love the wonderful flavor from the garlic in the rice. This deliciously simple combination of rice, broccoli, and carrots is tossed with warmed butter, olive oil and garlic mixture. Before you start cooking, make sure the cooked rice is ready and the veggies are chopped. Cook the broccoli in ¹/₂ cup boiling salted water for 5 minutes or until tender-crisp. Drain. Cook the carrots in ¹/₂ cup boiling water for 6 to 8 minutes. In a saucepan, heat the butter, oil, and garlic until warmed. 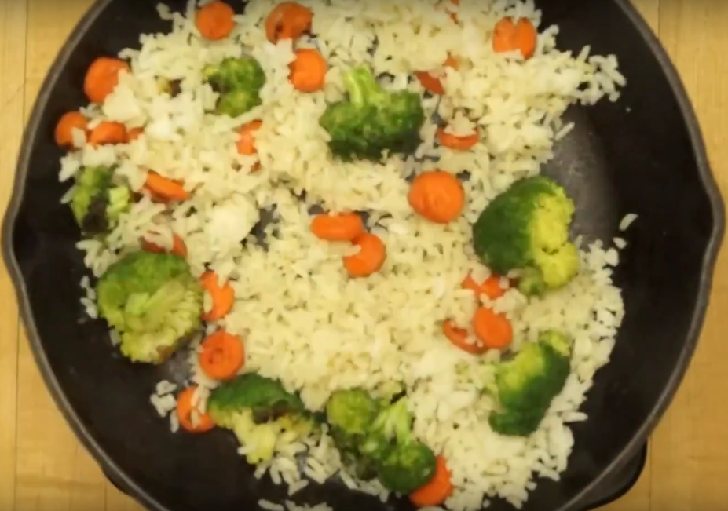 In a separate bowl, combine the rice, broccoli, and carrots. Toss with the butter mixture, cheese, and black pepper. Serve hot with extra Parmesan cheese, if desired. Good served with Roast Pork, stuffed onions, hard rolls, and a sparkling beverage.